Peggy/Steve is a het canon pairing of Steve Rogers (Captain America) and Peggy Carter in the Marvel Comics 'verse and related universes such as MCU. Peggy Carter and Steve Rogers are a canon couple in both the movies and comic books. They even get married in the alternate reality from the "House of M" storyline in the comics. Peggy/Steve is the most popular het pairing in the Captain America Movieverse and Agent Carter fandoms boasting the largest amount of fanworks, communities and overall fans. 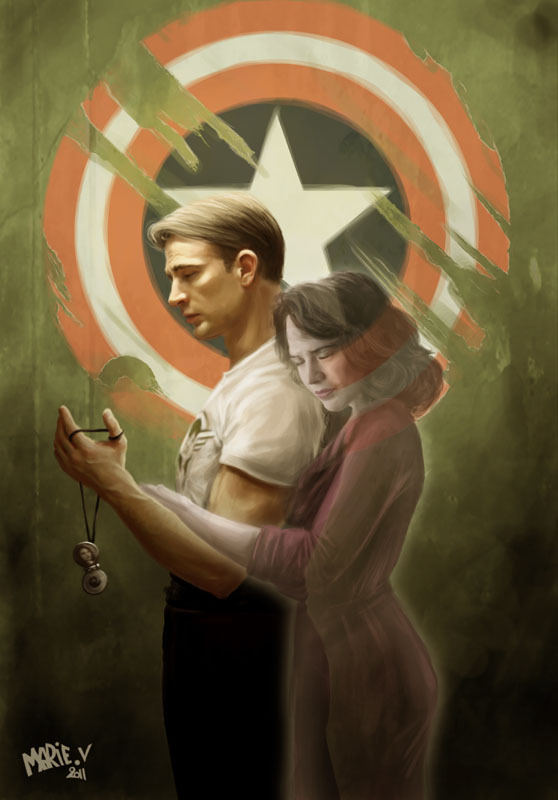 In the larger MCU fandom, Peggy is often acknowledged as Steve's first love (or second in the case of some Steve/Bucky works), even when the focus pairing is Steve/another character. Peggy acknowledged Steve Rogers as the love of her life in the intro for the first season of Agent Carter. Hayley Atwell frequently states that she loves Peggy/Steve relationship and that they were kindred spirits. Pre-Serum Steve Rogers - Due to Peggy's canon interest in the Movieverse to liking pre-serum Steve. Learning to dance/waiting for the "right partner"
Modern AU, where somehow Peggy and Steve are in the present times & the same age. In the case of picspams, gifsets or videos the creator often uses Chris Evans other films/TV shows such as What's Your Number? as well as Hayley Atwell's other films/TV shows, especially Hayley's new show Conviction. Can't Keep a Good Man Down by roboticonography After the serum, Steve has to deal with a persistent side effect. In his pants. We Still Talk by roboticonography Newlyweds Steve and Peggy take a holiday to get away from it all - but the great outdoors might hold more challenges than they bargained for! But I had a date…by Marie V.
This page was last modified on 21 March 2019, at 04:36.